Does the above statement ring a bell? Are there days where you feel as if you’re on a seesaw, teetering between feeling able to handle the stress and feeling choked with the weight of anxiety? Raising a child diagnosed with autism can be a unique and beautiful experience. However, despite the perfect family picture others may see, there may be times where you feel your life is shattering into many pieces. 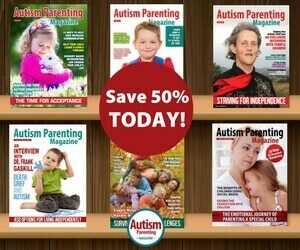 According to current research, parents of children who have been diagnosed with autism undergo the greatest degrees of stress compared to parents of children who have been diagnosed with other disorders or parents of typically developing children (Harper, Dyches, Harper, Roper, & South, 2013; Hayes & Watson, 2013; Kuhaneck, Madonna, Novak, & Pearson, 2015; McStay, Dissanayake, Scheeren, & Koot, 2014). Common stressors that are experienced by parents of children with autism include the delay in the diagnosis of autism, the financial burdens of treatment, and marital and family quality. It is also common for parents of children with autism to have concerns for the future of their child regarding their independence and social stigmatization experienced by their child (Altiere & von Kluge, 2009; Frye, 2015; Lee et al., 2012; Rivard, Terroux, Parent-boursier, & Mercier, 2014; Bitsika, Sharpley, & Bell, 2013; Harper et al., 2013). In light of this research, Karen and Emily decided to focus their Master of Occupational Therapy Capstone Project on stress experienced by parents of children with autism and how occupational therapy can address this issue. 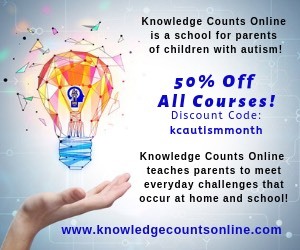 Their main concerns for parents of children with autism is their well-being and quality of life, as stress can exacerbate problematic psychological health issues, such as higher rates of depression and/or anxiety (Bitsika et al., 2013; Conner & White, 2014; Lee et al., 2012). 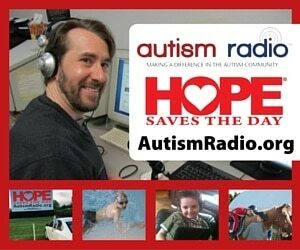 In order to take a deeper look into the stress that parents of children with autism face on a day-to-day basis, as well as to assess whether the proper resources or services are being offered to assist them in coping with the stress, the two occupational therapy students created an online survey that allowed them to gain insight into the lives of parents of children with autism. The survey integrated questions from the Autism Parenting Stress Index (APSI) to gauge parents’ subjective stress levels, depending on various aspects that may come with autism. Open-ended questions allowed parents to be honest about how the stress of having a child with autism affected their personal social life and how they currently cope (if they do) with stress. Additionally, they were asked which services (such as occupational therapy) or parental supports were provided to help them cope. 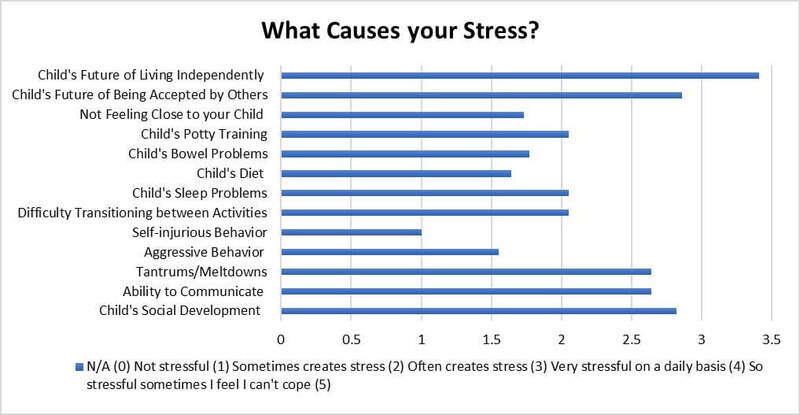 As described by the “What Causes your Stress?” chart, parents reported their top five stressors are thoughts of their child’s future of living independently, thoughts of their child’s future of being accepted by others, their child’s social development, their child’s ability to communicate, and their child’s tantrums/meltdowns. 1. 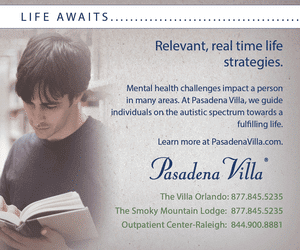 How has the autism diagnosis of your child impacted your own social life with your spouse, family, and/or friends? The stress of raising a child diagnosed with autism can surely shatter a parent’s social and personal life into pieces. However, may you find assurance knowing that you are not alone. Life can be pieced back together- with the help of certain supports and services. Occupational therapy is a service for individuals with disabilities to challenge physical, mental, or social limitations and to enhance the quality of life. Distinct from other disciplines, occupational therapists are licensed healthcare professionals who are trained to view any individual, from a school-aged child with autism to an emotionally-overwhelmed parent, through a holistic pair of glasses; thus, any aspect of life that seems to be crumbling to pieces is the focus of an occupational therapist- whether it be physical, emotional, spiritual, or social. Through environmental or task adaptation, sensory integration, and self-coping mechanisms, children diagnosed with autism can learn to interact with others and their environment. As occupational therapists’ focus is the improvement of well-being, quality of life, and functionality of children with autism, their ability to focus on the children’s parents could prove to be essential in improving family functioning. Whether it be helping parents find coping mechanisms that fit their family lifestyle, creating a weekly routine that schedules “spouse-time” or “alone time” while meeting their child’s needs, or searching for local parental support groups, occupational therapists can help parents find balance in their life. 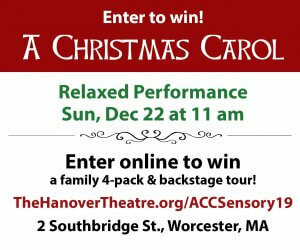 Also, they can teach parents how to explain their child’s diagnosis to family/friends or help them understand their child’s specific sensory needs. Through this teamwork with an occupational therapist, parents can learn how to “piece the puzzle” back together. 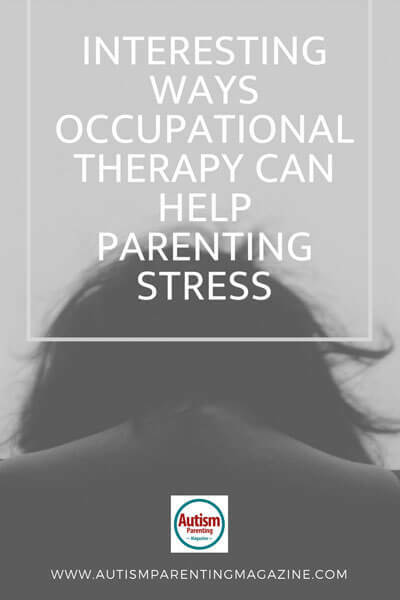 Ask your child’s occupational therapist or seek the help of an occupational therapist for advice on parental coping mechanisms and individualized stress management strategies. Emily Spencer and Karen Razon are proud graduates of the Master of Occupational Therapy program at Adventist University of Health Sciences in Orlando, Florida. This submission was a part of their Capstone Project, under the direction of their university advisor, Kim Gensolin, OTR/L. Both Karen and Emily have a passion for working with children and their families; Emily has recently accepted a position at a pediatric therapy clinic in Bradenton, FL and Karen is continuing to work at an outpatient pediatric clinic in Sanford, FL.